I think I'll keep a running "score" about the list of streets here at the top of page 2. * 4th St is know to be formerly named Broadway. ** Google Maps shows Alternate 5th St name to be COLLEGE RD, perhaps cottage is a typo. *** 1966 map shows road from intersection of 24 Ave and 5 St SW, travelling SW meeting with intersection of Cliff St and 25 Ave SW, could be Elgin? Road no longer exists. 4th and 5th St SW extended one block further north than current, and the road joining them was likely Centre-A. That block now taken up by "Eau Claire" condos, non of the extentions nor any east/west joining road exist now. Road no longer exists. This was possibly the north end of 15th St NE, extending north of Centre Ave and former Blackfoot Trail. Road no longer exists. Travelled north to Prince's Island canal from 1st Ave 1/3 block West of 6th St SW. Formed West 1/2 of a loop, East half known as King Street. Grassed over. Last edited by Chris E on Wed Jun 10, 2009 2:05 am, edited 18 times in total. Archer Road - 14st St. NE, North of Centre Ave. [Archer Road exists in 1956 map. It would seem from comparing with Google Earth that the current St. George's Drive was then 14A St.
That's what I see too from my 1966 map, 14A St north of center ave seems to match St George's Drive. Directly east of that was 14th St and then Hill Road. Archer Road was the most southern portion of 14th St (between Lambert and Centre) though I don't think Lambert extended across as far as the creek (as Centre did back then). If you look at Google Earth, 14th St doesn't exist now, but there is a pathway there that presumably would have been the road we're looking for. Yeah that seems to agree with my '66 map. It would be interesting to see if there's any signs of 14th st there, however it may have never been more substantial than dirt. By 1966 it's just shown as a green "Zoo Extension" Interesting that the '50 aerial photo doesn't show any of these streets, nor does the 66 map.. I wonder if they ever actually existed or were just planned? I also notice none of the aerials show 15 st really being there, if it is it seems to be a dirt track amongs the various parcels in that aera. 14A shows up much more clearly. Although as poor quality as this aerial is you can see how the property lines seem to line up east of 14A St around where my map shows 15 St would be located. Well I guess a check for pre 1956 sidewalk stamps are in order to see if the typos were in the book, or actually on the signs/sidewalk. I am of the mind that the book was just wrong about Manchester and Blackburn, as it does indicate they are one block apart, as they currently are, it just has them about 5 blocks further north and 5 or so blocks east of where they actually sit. 1955 map shows farmland where the book says they were located. McMahon and Chris E, you've both spent a lot of time on this subject, and the results make fascinating reading. I plan on having a copy of the 1911 City Engineering map made as I think it'd be an interesting project to compile the street names on the map and to then compare them with the names from the 1944 city manual. Another interesting project might be to search for the street names on Henderson Directories, for which editions from 1910 through 1953 are now online at: http://peel.library.ualberta.ca/bibliography/2961.html . I took a quick look using some of the names, without much success. I don't really have time to go through it, but that looks to be an excellent resource. I never knew something like that existed online. Thanks for that. There are also a number of historic fire hydrants, and the intake valve of Calgary's old gravity water system, salvaged from the Elbow River upstream of the Weaselhead. Thanks for that bit of info; it's refreshing whenever a City department takes the initiative to preserve our history so creatively. I wandered over today to take a look at the sidewalk stamps on display at the Manchester building you'd mentioned; the oldest is 1909. In the Beltline area, a 1907 stamp by the same contractor- BM&S Contracting- is still intact in a sidewalk at the 13th Ave and 9 St SW intersection. Up until recently, I had thought that 1907 was the earliest year for such stamps in Calgary, but was told recently by someone in the concrete business that a pre-1900 stamp was salvaged at the time of the Fort Calgary rebuild in the 90's. I'm skeptical about this though; has anyone else seen Calgary sidewalk stamps dated prior to 1907? Just log in as a guest. You can browse survey plans in map mode and pull up a preview of the original survey plans for free (you can get the detailed scans for a fee). A lot of the mystery street names existed legally but were never constructed (I think Archer Road is an example of this - it still exists in a legal sense today I believe). Many of the turn of the century maps show the legal subdivisions rather than what was actually built (to show all of the growth that was expected to come), and even modern ones done by companies not based in Calgary sometimes put legal roads on the maps like Archer Road even though they never existed (I've seen Archer on maps from the 80s even). Best combination is looking at the legal plans and the old airphotos to really determine what existed and how the roads changed over time. Hope I haven't missed anything; if I have please let me know. It all started on Linclon Avenue. David Peyto was part of a walking tour through Crescent Heights during Historic Calgary Week several years ago when he noticed an odd inscription in the sidewalk. Linclon Avenue, it said at the corner of 7th Avenue and 1st Street N.W. "I wondered if there were more that were misspelled," he said. Peyto, a retired schoolteacher and an enthusiastic historian, has been surfing Calgary sidewalks ever since. "It changed things," he said. "I can no longer take a walk without looking down at the sidewalk." He told Mike Kampel, his friend and fellow historical society member, about his interest, and it turned out to be contagious. "Be careful," Kampel warned. "You can easily become obsessed with sidewalks." The two are looking for more than concrete typos. They are compiling information about the companies that built the sidewalks, when the sidewalks were built and differences in sidewalk style. Style? You bet. Some of the concrete finishers showed touches of artistry as they plied their trade, adding graceful swirls and geometric patterns to their work. And since sidewalk builders have a habit of putting a company stamp with the date into the concrete, Peyto and Kampel can see where a sidewalk fits into local history. The oldest concrete sidewalks Peyto has found are in Victoria Park, where the date stamps go back as far as 1907. "There might be older ones, but I haven't found the dates yet," he said. "When you think about it, a sidewalk built in 1907 has been there for three-quarters of the city's history." Inglewood, Mission, Sunnyside, Ramsay and Rosedale are other communities with vintage sidewalks. Peyto still plans to surf the sidewalks of Bowness, Connaught, Mount Royal and other communities. The Linclon Avenue inscription is dated 1910, but Peyto has been unable to find any official record of a Lincoln Avenue, now 7th Avenue N.W. He has turned up other ghost street names, or names that have been changed. Sixth Avenue N.E., where it encounters Crescent Road, was once Somerville Avenue. Near St. Matthew's Lutheran Church in Bridgeland, 7th Street N.E. comes to a dead end, but not according to the sidewalk inscription. McBride Road, it reads, but there's no road, just a path meandering along the crest of the hill. It's dated 1949, but Henderson's City Directory that year makes no mention of McBride Road. Westward in Rosedale, there's a crescent named Alexandra or Alexander, depending on where you look. Peyto has found 11 inscriptions for the crescent -- six of them say Alexander, five say Alexandra. The 1914 city directory lists an Alexander Crescent and makes no mention of Alexandra. In the 1930 directory, it's Alexandra Crescent with no Alexander, and in 1988, it's back to Alexander, which is what today's street signs read. Confused spellings abound. Centre Avenue in Bridgeland, near the George Boyack Care Centre, was once Murdock Road N.E. Or Murdoch Road, if you check a couple of blocks over. In Ramsay, one corner reads McLeod Trail, while across the street it reads Macleod Trail. It's academic now -- the inscriptions are along Spiller Road. It was once the real Macleod Trail, where wagons and horses wound their way from the south toward Fort Calgary, before the current Macleod Trail was rerouted over the top of the cemetery hill. There's more confusion in Ramsay at the intersection of Burns Avenue and Salisbury Street. The southeast corner reads Salsbury Avenue on the southeast corner. On the northeast corner, it's Salisbury Avenue. The most misspelled name is Twelfth, Peyto said, such as at 12th Avenue and 3rd Street N.W., where the inscription reads Twelvth. And someone was having bad luck about 90 years ago in Inglewood when Thireenth East was stamped into the concrete at 10th Avenue and 13th Street S.E. Meanwhile, back in Bridgeland, Peter Gerlitz must have had some pull when the sidewalk was poured in front of his house, because "P. Gerlitz" is still plainly visible in the concrete. The 1914 Henderson's Directory lists a Peter Gerlitz living at 119 9A St. N.E., and lists his occupation as labourer. Did he perhaps work for the company that poured city sidewalks? The inscription no longer marks his house, though -- it looks out over the parking lot that once served the now-imploded Calgary General Hospital. In other areas, house numbers were inscribed in the concrete, and a few of those can still be found, though not all match current addresses. Errors may have occurred, Peyto speculates, because some of the workers who helped with the early sidewalks did not know English well or were illiterate. Encouraged by Kampel, Peyto is considering compiling his findings and research into a book. The tentative title is History Under Your Feet. He'll check it carefully for typographical errors. When this thread started 6 years ago, the subject of the 1910 City Engineering map was introduced, which contained street names already in existence plus some rather fanciful new ones for the suburbs just being annexed at that point. For example, were you to have resided in Mountview or Balmoral back then, your streets would all have biblical names. 1st Street NE was to become Judas Street! Here's an insight as to why naming streets in the new suburbs en masse fell out of favor within just a year or two. In early 1911, the Herald reported that 160 Crescent Heights residents had successfully petitioned the city to use numbers and not names for the streets in that community. Alderman J.G. "Gravity" Watson then commented, "if it is the intention to change the names of the streets there, I think it should be done all over the city." The Herald article went on to state that the "commissioners will consider the using of numerals instead of names on every street in the entire city". 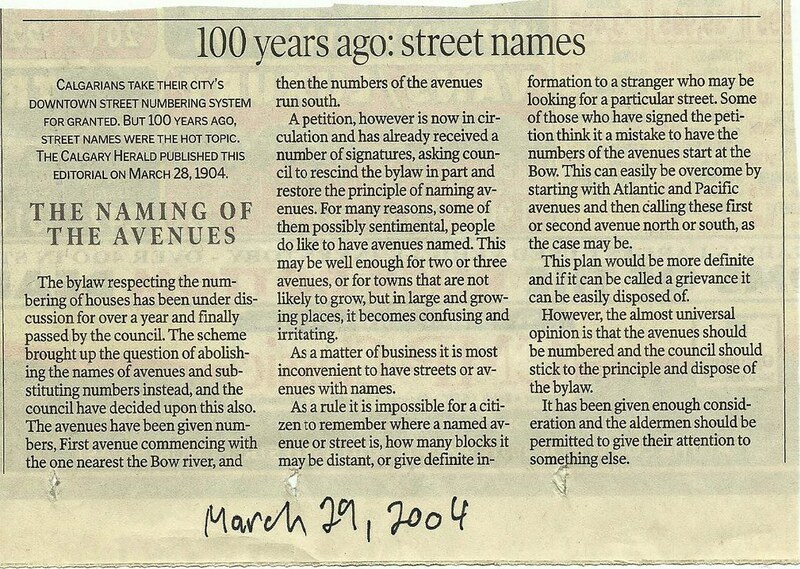 Not sure yet what exactly the residents of Crescent Heights had against named streets; perhaps with the misspelling of Lincoln Avenue (7th Avenue and 1st Street NW) that took place in 1910, they were concerned with further such errors. Or perhaps they didn't approve of the new street names- chosen presumably by the Engineering Department- on their behalf.